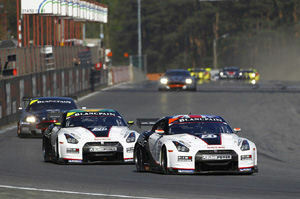 Round 2 of the 2011 FIA GT1 World Championship took place on April 9th and 10th, 2011 in the Dutch Zolder. The victory in both races went to the No.38 All-Inkl.com Münnich Motorsport Lamborghini Murcielago 670 R-SV of Marc Basseng and Markus Winkelhock. In contrast to the inaugural event at Yas Marin in Abu Dhabi, the Nissan GT-R's had a rather difficult weekend due to several accidents, with the No.23 JRM GT-R scoring the best positions in both races: 7th position in the Qualifying Race and 9th in the Chamionship Race. Marc Basseng and Marcus Winkelhock in the No.38 All-Inkl.com Münnich Motorsport Lamborghini Murcielago 670 R-SV took their maiden victory in GT1 in a thrilling Qualifying Race in Zolder. Second place went to the No.11 Exim Bank Team China Chevrolet Corvette Z06 of Mike Hezemans and Nicky Catsburg, which had been a surprise leader for the first half of the race. 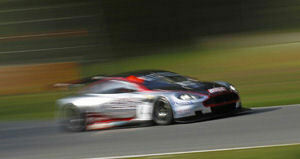 The No.7 Young Driver Aston Martin DBR9 of Tomas Enge and Alex Müller rounded out the podium in third. The Nissan teams endured a difficult Qualifying Race in Zolder, as a series of dramatic incidents and accidents greatly impacted on the performance of three of the four Nissan GT-Rs on the grid. The German pairing of Michael Krumm and Lucas Luhr, driving the No.23 JR Motorsports Nissan GT-R, finished highest amongst the Nissans in seventh place, just outside the top-six points scoring positions. The outlook was positive at the start of the race, with the No.22 JRM Nissan GT-R of Richard Westbrook and Peter Dumbreck occupying third on the grid after the morning's Qualifying session, Jamie Campbell-Walter and David Brabham's No.21 Sumo Power GT lying seventh, and the No.23 JRM also sitting within the top-ten, in ninth place. However, it only took a few short seconds at the start for things to change drastically. A dramatic start set the tone for the rest of the race, as the front row starters, the No.37 All-Inkl.com Lamborghini and the No.8 Young Driver AMR, clashed at the first corner, effectively ending both cars' challenges. 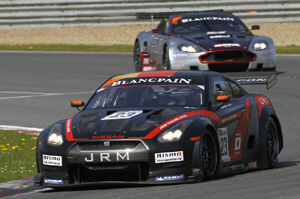 Westbrook, milliseconds behind in the No.22 Nissan GT-R, found himself unable to do anything to avoid being hit himself. The contact forced him to come into the pits instantly, where the decision was soon taken to retire the car due to a badly damaged suspension. The first corner carnage caused a major reshuffle in the pack, as Nicky Catsburg in the No.11 Exim Bank Team China Chevy Corvette moved from sixth into the lead by turn two. Second fell to the fast-starting No.41 Marc VDS Ford GT, which had started from 10th, while third was occupied by eventual race winners Marc Basseng and Markus Winkelhock in the No.38 All-Inkl.com Lamborghini Murcielago, which had started from 12th position. The trio was joined by Alex Müller and Tomas Enge in the No.7 Young Driver Aston Martin in a four-way battle for the lead, which reigned until the opening of the pit stop window when the No.41 Marc VDS Ford GT was finally able to end Catsburg's impressive resistance in the Chevrolet Corvette and move into the lead. The remaining three Nissans sat seventh (No.23), eighth (No.21) and ninth (No.20), which is how it remained until the pit window opened 25 minutes in. Hexis AMR then came to the fore as they produced a scintillating pit stop routine to help the No.4 Aston Martin of Christian Hohenadel and Andrea Piccini jump into the race lead, as a wheelsocket problem befell the No.41 Ford during its pit stop and dropped it from first to seventh. That left the No.4 Hexis Aston Martin leading ahead of Hezemans in the No.11 Corvette and Basseng in the No.38 Lamborghini, but with 20 minutes of the race remaining, the gaps began to close as the trio were covered by less than one second. The No.23 JRM was the first of the Nissans to pit, but it wasn't the smoothest of stops, and the car found itself dropping several places once all the vehicles on track had changed their tires and drivers. With much better changes for the other two cars, the Nissans emerged from the pit window seventh (No.21), ninth (No.20) and 10th (No.23). 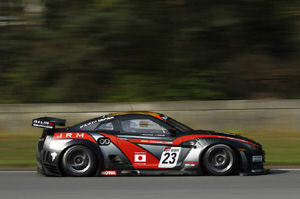 However, with regard to the Nissan GT-R's, the incidents weren't finished there. On lap 31 Ricardo Zonta, coming in for fellow Brazilian Enrique Bernoldi in the No.20 Sumo Power GT, was forced to pit a second time having suffered a puncture, and a lap later, with the car far behind the rest of the field, the decision was taken to retire it from 12th position. That left two Nissans in the race, with Campbell-Walter in the No.21 Sumo Power GT Nissan GT-R driving excellently to move into sixth, but further misfortune was soon to strike when a broken drivetrain ended the Briton's hopes of finishing within the points. Hezemans in the No.11 Exim Bank Corvette meanwhile defended doggedly for several laps but was finally unable to resist Basseng's charge as the German moved the No.38 All-Inkl.com Murcielago into second through turns two and three, before locking onto the back of the lead No.4 Hexis Aston Martin DBR9. There was still time for late drama however as with four minutes of the race remaining, Basseng made light contact with the No.4 Hexis DB9, which suffered suspension damage and was forced to retire. 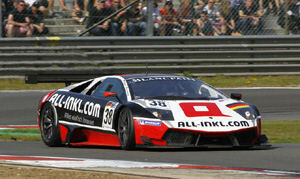 That left Basseng free to take the chequered flag and with it the All-Inkl.com squad's maiden GT1 victory. Hezemans in the No.11 Chevy Corvette had to defend again in the closing stages but coped admirably to secure second in the Exim Bank Team China's Corvette, with the No.7 Young Driver Aston Martin DBR9 surviving a three-way fight for the line to clinch third. There were several other casualties throughout the race, including both Belgian Racing Ford GT cars which clashed on lap nine at the second chicane, the resulting damage ruling out both cars from their home Qualifying Race. Happily, the sole remaining No.23 Nissan GT-R, with Luhr behind the wheel, was able to see out the race, ending up in a creditable seventh position. Speaking afterwards, Lucas Luhr had a philosophical perspective on the day's events, stating: "Overall, we have to focus on the fact that we are two places better off at the end of the race than we were at the beginning, so we can't be too unhappy. We had problems with the pitstop, without which we would have finished a few places higher, but this is a part of racing. Generally, the car felt really solid and quick. "We just have to hope things go our way in the Championship Race. We could do with the exact opposite of what happened in main race in Abu Dhabi - when we had a high starting position but finished quite far down the field - occurring tomorrow!" Jamie Campbell-Walter commented: "It was a bit disappointing to have to retire from sixth place because the car was holding its own, even though I felt a vibration when leaving the pit-lane after the change-over, and had to take things a bit easy. That alone shows the huge potential this car has - if the Nissans have more luck tomorrow than we did today, who knows what can happen?"